forearm to form the elbow. Its anatomical portions include a head (a rounded portion that fits into a recess of the scapula) called the glenoid fossa; the shaft, which is the main part of the humerus; and the distal end, which includes the prominence (called an epicondyle) and the surfaces that articulate with the bones of the forearm. Radius and Ulna.When the arm is in the anatomical position with the palm turned forward, the radius is on the lateral (thumb) side and the ulna is on the medial (little finger) side of the forearm (fig. 1-22). When the hand is pronated (with the palm turned downward), the bones rotate on each other and cross in the middle. This pronation makes it possible to turn the wrist and hand (as when opening doors). The ulna and the radius articulate at their proximal ends with the humerus, at their distal ends with some of the carpal bones, and with each other at both ends. Carpal.There are eight carpal bones, arranged in two rows, forming the wrist. Metacarpal.The metacarpal bones are numbered one to five, corresponding with the five fingers, or digits, with which they articulate. The f i n g e r s a r e n a m e d a s f o l l o w s : 1 s t  t h u m b ; 2ndindex; 3rdmiddle; 4thring; and 5thlittle. Phalanges.The small bones of the fingers are called phalanges, and each one of these bones is called a phalanx. Each finger has three phalanges, except the thumb (which has two). The phalanges are named for their anatomical position: The proximal phalanx is the bone closest to the hand; the distal phalanx is the bone at the end of the finger; and the middle phalanx is the bone located between the proximal and distal phalanges. LOWER EXTREMITY.The lower extremity includes the bones of the hip, thigh, leg, ankle, and foot. 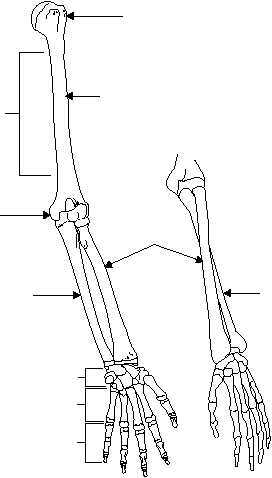 The bones that form the framework of the lower extremities are listed in table 1-2. 1-13 HEAD OF HUMERUS (GLENOID FOSSA) HUMERUS RADIUS ULNA SHAFT OF HUMERUS ULNA DISTAL END (EPICONDYLE) CARPALS METACARPALS PHALANGES HAND SUPINATED HAND PRONATED HM3f0122 A B Figure 1-22.Left arm: A. Frontal view of left arm with hand supinated; B. Frontal view of left arm with hand pronated.